If you were asked to describe the ideal holiday season, chances are you would include the company of loved ones, good food, fun and relaxation, and maybe an inch or two of snow. It seems so simple, but for many of us, this could not be farther from reality. Too often, the holidays seem to exhaust rather than uplift us. Do you sometimes feel trapped by the shopping, spending, and frenzied preparations? Do you want your holidays wrapped more in meaning and less in stuff? If so, you’re not alone. 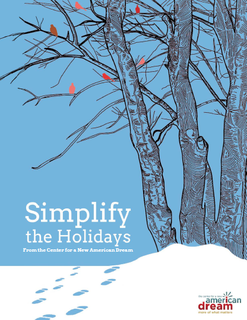 We hope our Simplify the Holidays booklet will help you reduce stress and increase your personal fulfillment during this holiday season.